2012 wasn't all doom and gloom. The past 12 months also ushered some of the most ground-breaking innovations and commitments the world has ever seen. From the first-ever flexible fiber-optic solar cell to a new California law designed to crack down on human trafficking and slavery across the planet, here are seven stories that are changed the face of fashion, science, and social justice this year. 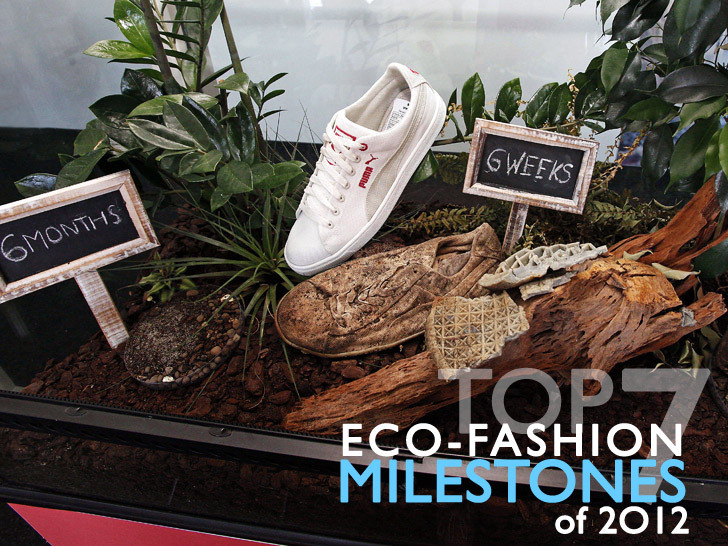 Above, Puma announced in October a line of Cradle to Cradle-certified apparel, shoes, and accessories that will either be biodegradable or recyclable through the manufacturer's take-back program. Squeaky wheel, meet grease. After weeks of relentless campaigning by Greenpeace’s “Detox” initiative, both Zara and Levi Strauss committed to eliminating all releases of hazardous chemicals from its products and supply chain by 2020. The world's No. 1 apparel retailer and the denim giant were joined by the likes of Mango, Esprit, and Marks & Spencer this year, bringing the total number of brands making “credible commitments” toward zero discharge to 11. H&M made history in December when it announced the launch of the world's first global clothing-recycling program. Starting February, and spanning all 48 of the Swedish retailer's markets worldwide, the initiative will accept items of clothing from any brand and in any condition. For every bag deposited, the customer will receive a voucher to put towards a future H&M purchase. The collected garments will then be handled by I:Collect, a clothing-recycling firm that will reprocess the materials and make them available for new use. July saw the debut of the “Higg Index,” a new open-source tool for measuring apparel and footwear sustainability across the industry value chain. Developed by the Sustainable Apparel Coalition, the Index was the first public rollout from the motley crew of manufacturers, retailers, non-governmental organizations, and academic experts, which include such bold-face names as Adidas, Esprit, Gap, H&M, Levi Strauss, Nike, Marks & Spencer, Patagonia, Timberland, Target, Walmart, the National Resource Defense Council, and the U.S. Environmental Protection Agency. Make way for the world's first fiber-optic solar cell. Unlike traditional components, which tend to be rigid and unyielding, the silicon-based wire is no thicker than the width of a human hair. Scalable to many meters in length, the fiber opens up the possibility of a new generation of flexible fabrics capable of converting solar radiation into direct-current electricity. Lab-grown leather apparel could hit the runways in as little as five years—all without harming a hair on a single animal’s head, according to Andras Forgacs, co-founder and CEO of Modern Meadow, a Missouri-based startup that’s approaching meat-and-leather production from an tissue-bioengineering, rather than farming, point of view. Backed by Breakout Labs, the grant-awarding foundation headed by PayPal co-founder Peter Thiel, Modern Meadow seeks to combine regenerative medicine with three-dimensional printing to synthesize leather and ultimately meat. Just one question: Will animal-rights advocates bite? For indentured workers and human-rights advocates across the globe, January 1 was a happy new year, indeed. That’s when a groundbreaking anti-slavery retail and manufacturing law went into effect in California. Although several states already prohibit forced labor and trafficking, the new California Transparency in Supply Chains Act is the first legislation to address the supply chain on an international scale. Its gist: Any Golden State company worth at least $100 million in sales—that includes businesses like Gap and Apple—must disclose on a “conspicuous and easily understood link” on its website if it’s taking measures to eradicate slavery and human trafficking in its supply chain.